The Alpharetta Convention and Visitors Bureau is highlighting Verizon Wireless Amphitheatre with a concert series giveaway. The Alpharetta Convention and Visitors Bureau is a proud supporter of intimate venues in Alpharetta such as Matilda’s, The Velvet Note and Chukkar Farm which bring in singer-songwriters, jazz artists and well-known bands. For those looking for concerts on a bigger scale, Verizon Wireless Amphitheatre at Encore Park, the city’s 12,000 seat state-of-the art architectural gem, is the place to be. Whether patrons are sitting in one of the 7,000 covered seats or on the lawn, they will surely have an awesome time rocking out with friends at any of the scheduled concerts. More concerts will be announced for the season at a later date. For up-to-date listings of performances visit http://www.awesomealpharetta.com. The Alpharetta Convention and Visitors Bureau is giving away two prime seats to Verizon Wireless Amphitheatre at Encore Park concerts from April through June 2016 with its “Let’s Rock! Concert Series Giveaway.” The lucky winner won’t miss a minute of the excitement and will receive parking passes, seats and access to the Carl Black Club and will have a blast as some of today’s leading artists rock the city of Alpharetta. Enter now through March 31, 2016 at http://www.awesomealpharetta.com. 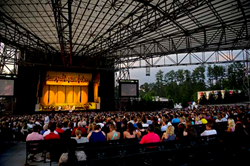 The Alpharetta CVB partners with Verizon Wireless Amphitheatre to provide concert-goers with an outstanding experience before and after the show. Stay at one of Alpharetta’s upscale and modern hotels and check http://www.awesomealpharetta.com for Verizon Wireless Amphitheatre packages.